Nettle is a member of the Urticaceae family, which includes as many as 500 species worldwide. Many species are tropical. The stinging nettle (Urtica dioica) grows wild in nitrogen-rich soil on the edges of fields, stream banks, waste places, and close to stables and human habitations throughout the United States and Europe. This fibrous perennial is found throughout the world in temperate regions from Japan to the Andes Mountains. The plant seeds itself, and, in favorable conditions, nettle spreads freely from its tough, creeping yellow root. The hairy, erect, single stalks grow in dense clusters giving the plant a bushy look. The square stems produce heart-shaped, alternate leaves with pointed tips and deeply serrated edges. Leaves are dark green on the top and are a paler green and downy on the underside. The plant grows as tall as 4 ft (1.2 m). Leaves and stems are covered with needlelike hairs that pierce the skin on contact. The plant delivers a sharp sting and a lingering irritation caused by a combination of formic acid, serotonin, acetylcholine, and 5-hydroxytryptamine injected through the tiny needlelike hairs. The common name nettle is taken from the Anglo-Saxon word noedl meaning “needle.” Nettle’s tiny green flowers grow in dangling clusters in the angles formed by the stalk and stem of the leaf. Flowers bloom from July to September. Each small fruit contains just one seed. Male and female flowers usually grow on separate plants of the stinging nettle, hence the species name dioica, meaning “separate,” or “two houses.” The genus name, Urtica, is taken from the Latin uro, “to burn.” Small nettle (U. urens), an annual, usually has both male and female flowers on the same branched cluster. Its properties and uses are similar to those of the stinging nettle. Older herbals cite the planet Mars with dominion over this common wayside plant. Nettle was certainly used in many battles. 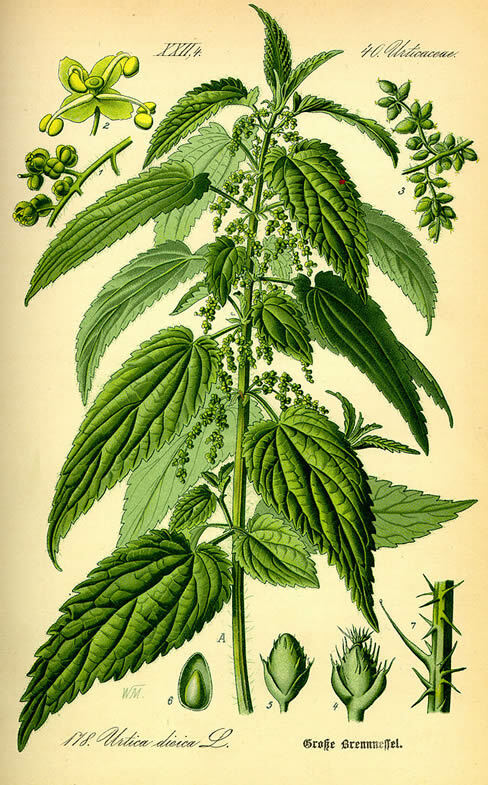 Roman nettle (U. pilulifera) is said to have been brought to Britain by Caesar’s troops, who used the plant to flail themselves in an effort to keep warm in the cool, damp climate. Nettle’s fibrous characteristics rival those of hemp and flax. Nettle fibers were woven into fabric for sails and ropes, and for German army uniforms as recently as World War I. Despite its piercing defense, the stinging nettle has long been valued as a medicinal and nutritional treasure. Nettle has astringent, expectorant, galactagogue (milk producing), tonic, anti-inflammatory, hemostatic, and diuretic properties. The plant is rich in chlorophyll, and a good source of beta carotene; vitamins A, C, and E; tannins; iron; calcium; phosphates; and various other minerals, especially silica. The active ingredients include water-soluble polysaccharides that stimulate the immune system, and large protein-sugar molecules known as lectins. The entire plant may be used in various medicinal preparations. Nettle leaf is used in a simple infusion as a tonic decoction to cleanse the blood. Nettle can also be combined with yellow dock (Rumex crispis), dandelion (Taraxacum officinale), cleavers (Galium aparine), and burdock root (Arctium lappa). In folk medicine, the plant was used in a practice known as urtication. The fresh herb was thrashed across the skin to induce a stinging, burning sensation used to relieve the deeper pain of rheumatism. A leaf infusion, or a homeopathic tincture of nettle, may also be helpful as supportive therapy for rheumatism. With sufficient water intake, nettle acts as a diuretic and is helpful in treating arthritis and rheumatism. 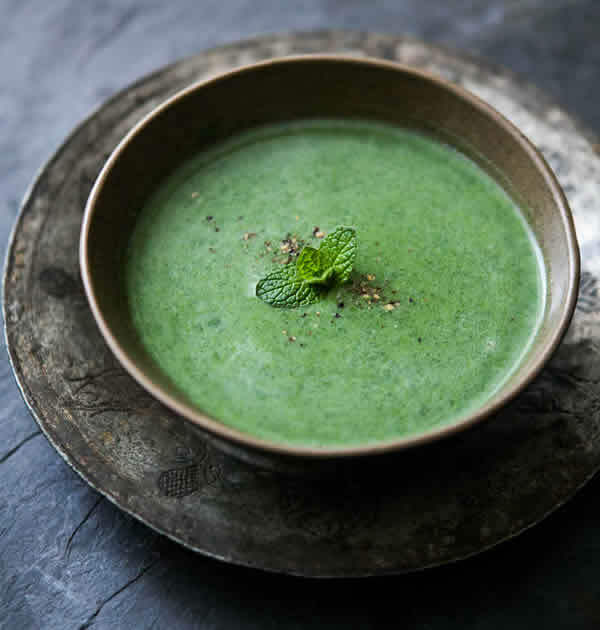 A team of German researchers has reported that the anti-inflammatory effect of nettle is related to its suppression of a type of cell that stimulates the inflammatory response. An early twentieth-century herbalist reported that the juice of the fresh leaves and root (or the dried leaf when burned and inhaled) was useful to treat asthma. Nettle seeds, when ingested, were once thought to be beneficial in the treatment of bites from “mad dogs” or the stinging of “venomous creatures,” according to Nicolas Culpeper, a seventeenth century doctor. Seeds were also used as an antidote to poisonous herbs such as nightshade (Solanum dulcamara) and henbane (Hyoscyamus niger), though no recent studies support this use. Nettle is thought to be particularly helpful for treating urinary tract problems. An infusion of the leaves may be used for inflammatory diseases of the lower urinary tract. The infusion is thought to flush the system and to help expel kidney gravel. It has also been used internally to stop bleeding. An ointment preparation of the aerial parts, or a strong infusion, can be applied externally to relieve hemorrhoids. Nettle can increase and enrich the flow of milk in breast-feeding mothers. Clinical studies have confirmed stinging nettle’s benefit to men in reducing symptoms of benign prostatic hyperplasia (a noncancerous enlargement of the prostate gland). A concentrated root extract of nettle is sometimes combined with saw palmetto (Serenoa repens) and the bark of the pygeum evergreen tree (Pygeum africanum) to treat the early stages of the disease. The herbal combination helps to increase the urinary volume and maximize the rate of urine flow. German research suggests that active ingredients in the nettle root may reduce prostate swelling. During allergy season, a tincture of the fresh herb, or an infusion as a tea, may reduce symptoms of hay fever, such as itchy eyes and sneezing. However, a study published in 2002 indicates that the antiallergic effects attributed to nettle require further study. 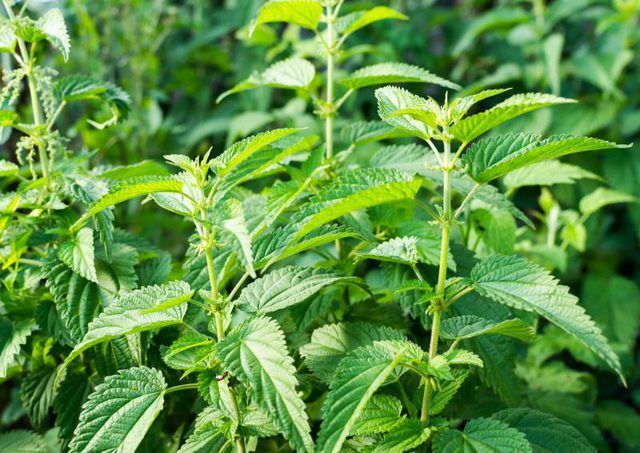 Nettle’s expectorant properties have been beneficial for coughs and have been used to expel phlegm from the lungs and stomach. The freshly gathered and cooked herb was used as a nutritive potherb in folk medicine to treat consumption. Nettle continues to be valued by wild-food foragers as an early spring potherb, rich in minerals. Nettle juice may be used as a vegetarian substitute for rennet to curdle milk when making cheese. When boiled with equal parts vinegar and water, a decoction of the plant (particularly the root) is a beneficial and conditioning hair and scalp rinse useful in cases of dandruff and thinning hair. A nettle rinse won’t restore hair to a bald head. However, it will lend a shine and enhance the color of the hair one does have. A small piece of cotton soaked in a nettle decoction and placed in the nostril can be used to stop a nosebleed. The root, when boiled, will produce a yellow dye, and the leaves produce a permanent, light green dye for wool. Numerous commercial preparations of the herb are available in the form of capsules, dried leaf for tea, homeopathic tinctures, or ointments. The medicinal potency of the herb will vary depending on the growing conditions and the manner and care with which the herb is harvested and prepared. The fresh leaves and stems should be gathered from young plants on a dry day, just before the plant flowers. Caution should be used when harvesting to avoid the sting. Nettle’s aerial parts may be used fresh or dried. To dry, the bunches are hung upside down out of direct sun in an airy room. The root is harvested in the fall when the plant has died back. It is washed thoroughly. Large roots may be chopped into slices while fresh and spread on a tray in a warm, sunny room for several days. Dried plant parts are stored in sealed containers in a dark place. To make an infusion, 2 oz of fresh, finely chopped nettle leaves are combined with 2.5 cups of fresh, nonchlorinated water (2 tbsp of the dried herb may be used). This mixture is brought to a boil, removed from the heat, and covered. The tea is steeped for about 10 minutes. It is then strained and can be drunk warm or cold. The prepared tea can be stored for about two days in the refrigerator. Dosage for a general tonic is 3 or 4 cups per day. Ample fresh water should be drunk when using nettle as a diuretic tea. To make a decoction, 2 oz of fresh or 1 tbsp of dried root is combined in a nonmetallic pan with 2.5 cups of water. The mixture is simmered for two minutes, then steeped for 10 minutes. The mixture is then strained. To extract the juice, an abundance of nettle leaves and stems are gathered. A household food processor or juicer may be used to pulp the plant parts. The resulting pulp is then squeezed through a sieve. The juice is then sealed in dark glass containers and refrigerated. To make an essential oil, the fresh nettle leaves and stems are packed in a large glass container. They are then covered completely with olive oil. A lid is placed on the container and the mixture is left on a sunny windowsill for two to three weeks. It is stirred daily. After this time period, the mixture is strained through cheesecloth and the oil is stored in a dark glass container. To make an ointment, beeswax or petroleum jelly is melted in the top of a glass or ceramic double boiler. Finely chopped nettle leaf and stems are stirred in. The mixture is heated on low for about two hours. The mixture is strained through cheesecloth and, with gloved hands, the liquid is squeezed from the cloth. The liquid is then poured into clean, dark glass storage containers while still warm. The containers should be sealed with tight-fitting lids and stored away from direct sunlight. Gloves should always be worn when nettle is harvested to avoid the sharp sting. According to folk tradition, fresh yellow dock leaves may alleviate the burning when rubbed on nettle stings. When using stinging nettle preparations to irrigate and flush out the urinary tract, or as a treatment of kidney gravel, abundant fluid intake is required. Stinging nettle preparations are not to be used in the treatment of fluid retention brought on by reduced heart or kidney function. This plant should never be harvested after flowers appear because if harvested at this time, the plant can cause urinary tract damage. Aside from the distinctive sting when touching the fresh plant, there are few side effects from use of the herb in properly prepared therapeutic doses. Mild gastrointestinal distress may occasionally occur. Some people are allergic to nettle. This plant should not be consumed raw because it can irritate mucous membranes. Leaves of the young plant can be safely consumed when cooked as a nutritional potherb. Boiling the young leaves and stems disarms the stinging hairs. Drying the herb also disarms the stinging hairs. The uncooked, mature nettles should not be eaten. Nettle appears to intensify the effects of nonsteroidal anti-inflammatory drugs, or NSAIDs, which are commonly given for arthritis and similar conditions. While this increased effect may be beneficial to patients with arthritis, they should nonetheless consult a healthcare provider before taking nettle.